Every spring, I welcome the new crop of produce available at the market, as well as the flowers starting to poke through the soil in front of my condo: hyacinths, daffodils, and tulips all represent the beginning of spring to me. I may not yet have flowers to enjoy, but I can at least start cooking. 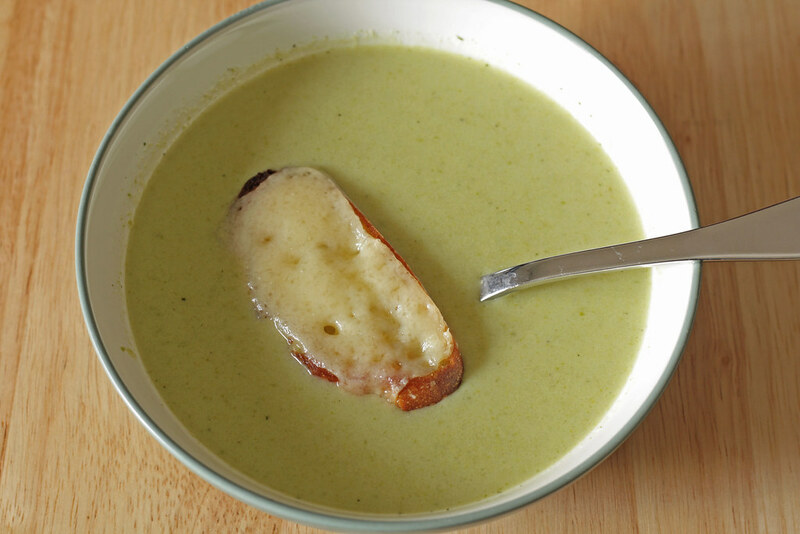 I saw an easy recipe for cream of asparagus soup in Everyday Food, and I couldn’t wait to try this soup on a cold, grey day. The time arrived earlier this week. I was a little short on the amount of asparagus needed (the original recipe calls for three pounds), so I decided to add some green beans that had been hanging out in my freezer a little too long. 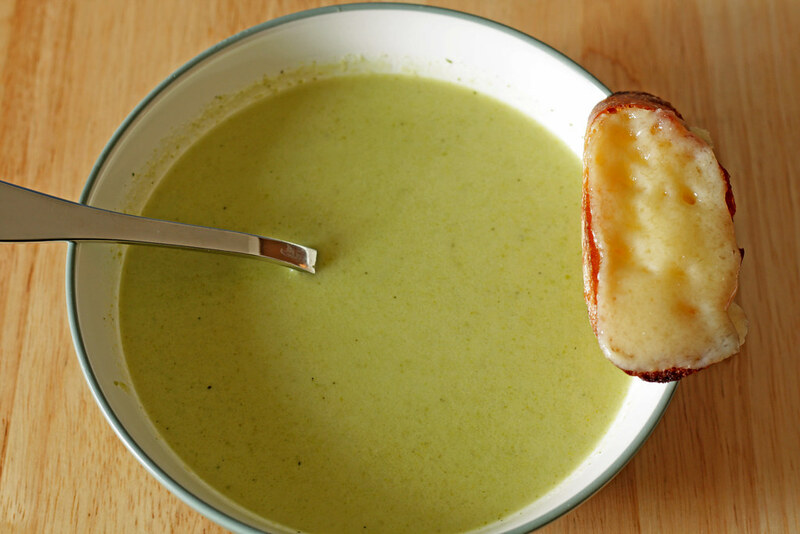 Even with my changes, the taste of asparagus was the most prevalent in this soup. The lemon helped brighten things up and cut through the fat a bit, resulting in a nice overall balance. I made the cheesy croutons to go with the soup because, frankly, the soup alone for lunch wouldn’t be enough to get me through to dinner. I used gruyere because I adore it, but as I ate the first crouton I realized that parmesan probably would have been a better choice. Oh well, next time. . . Melt butter in medium saucepan over moderate heat. Add shallots and cook until soft. Add flour and cook, stirring frequently, for one minute. Add asparagus, beans, and water; season with salt. 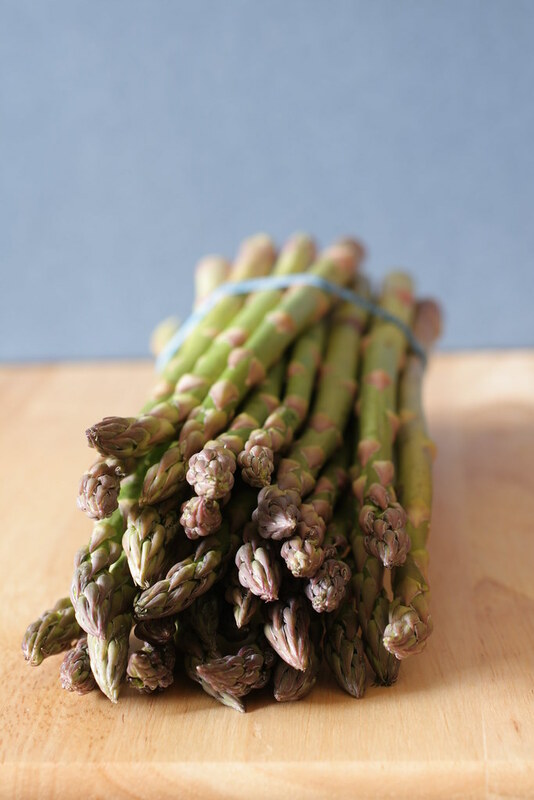 Cover and bring to a boil; reduce heat and cook for 3-5 minutes, or until asparagus is bright green. Uncover and remove from heat. Puree using an immersion blender (or in batches using a standard blender). Add lemon juice and cream, taste for seasoning, adding more salt if necessary. Preheat oven to 450*F. Arrange bread on a rimmed baking sheet and brush both sides with olive oil. Bake for 5-7 minutes or until golden. Turn the broiler on. Place a slice of cheese on each crouton and broil until bubbly. Serve the croutons with the soup. I’d love it if you would check out and follow my blog! It’s my journey exploring the way American women value food and how we can be better served by a more traditional approach to eating and meals. Thanks for this recipe. I love your cheesy croutons, it looks yummy. Where do you use the green beans mentioned in this recipe, or was that a mistake. Whoops, I seem to have left the beans out of the intructions. I added them with the asparagus – the recipe instructions have been corrected. How many 8 oz. servings does this make? I’m assuming that it is served warm.